Printed Circuit Boards, also referred to as PCB, are copper-clad, glass fiber impregnated Epoxy / resin plates on which electronic components are interconnected via conductors. 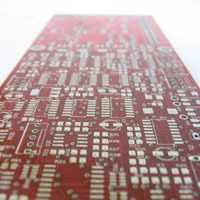 Multi-CB offers various options for professional PCB manufacture. We manufacture high quality printed circuit boards with 1-48 layers and are proud to be one of the leading B2B provider in the printed circuit board area. Our customers benefit from our years of experience, technical know-how and our first class service. And of course by the very reasonable prices - according to the motto: "High-Tech at Low-Cost". Find out now, order in our online calculator your quality PCB. With the Multi-CB PCB calculator you can quickly and easily calculate the price of your PCBs and SMD stencils! Our offer includes all the steps from the configuration in the PCB online calculator on to technical examination (design rule check) up to dispatch of the required PCB. The boards are tailored to your needs. Because the PCBs can be produced with up to 48 layers, also technically complicated requirements can be mastered. On the Internet, you have the possibility to configure printed circuit boards, which meet your requirements. The order can be quickly and easily transact online. To design your PCB you can make use of our PCB Design-Aid. This makes an error-free PCB layout possible - and saves you in the process your order time and costs. If you should have still technical issues regarding design or tolerances of certain options please contact our service team which gratefully will advise you. With our online PCB calculator, it is quite simple to get the most affordable price for your Printed Circuit Board / PCB. In addition, we provide our customers with attractive discounts, e.g. for as re-orders. And also our dispatch and delivery offers a strong service. Within a few days you will receive the ordered goods with our delivery partner UPS. And if it has to be very fast, again: just use our 48-hour express service. High-quality printed circuit boards at unbeatable conditions - Multi-CB.